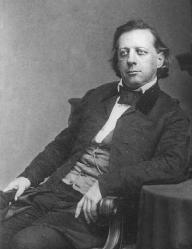 Henry Ward Beecher was one of the most prominent U.S. ministers of the nineteenth century as well as an active participant in various reform movements. Beecher was born June 24, 1813, in Litchfield, Connecticut. He was the son of preacher Lyman Beecher and the brother of Harriet Beecher Stowe, author of Uncle Tom's Cabin. He studied at Amherst College and Lane Theological Seminary and served as a novice minister in Indiana before becoming minister at the Plymouth Congregational Church in Brooklyn, New York, in 1847. A liberal thinker, Beecher was in favor of such principles as women's suffrage, Abolition of Slavery, and acceptance of the theory of evolution and often lectured on these and other controversial ideas from the pulpit. Beecher excelled as a speaker and in 1863 he went on a lecture tour throughout England and spoke in support of the Union position in the Civil War. "It usually takes a hundred years to make a law, and then, after it has done its work, it usually takes a hundred years to get rid of it." In 1875, Beecher, regarded as one of the United States' foremost preachers, was involved in a sensational trial that damaged his honor. Journalist Theodore Tilton accused the minister of committing Adultery with Mrs. Tilton. Beecher was expertly defended by his attorney, william m. evarts, and, after a lengthy trial, the jury could not agree on a verdict. Beecher's church proclaimed him the victor and officially cleared him of the charges. In spite of the scandal, Beecher continued to be an influential force in the U.S. ministry until his death on March 8, 1887, in Brooklyn.